As much as I love my phone, there is no substitute for writing things down and having notebooks. 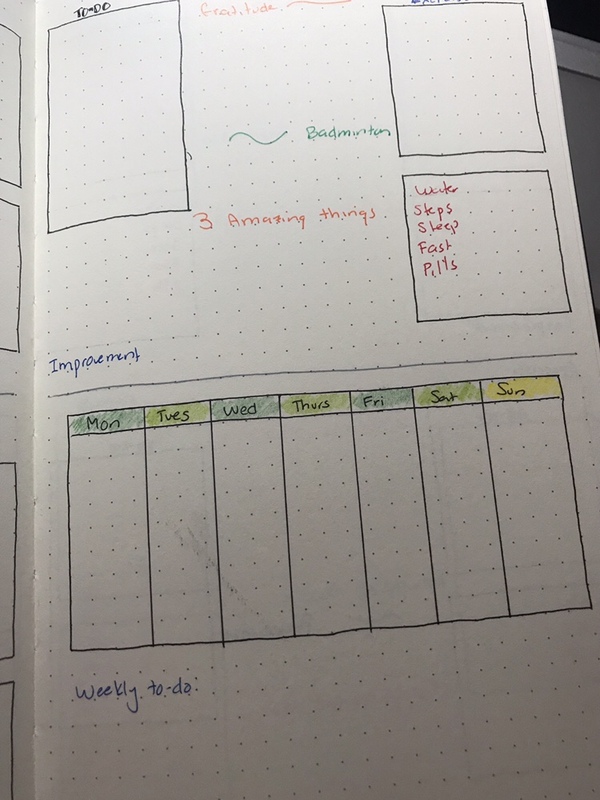 I’ve heard about bullet journals for awhile, and while I was intrigued, I had never done it before. A bullet journal is a journal that is handmade and unique to the person who made it. You can use it to keep track of goals, write your diary, keep a to-do list, tracker, basically anything you want. It’s like a diary mixed with a planner and a to-do list. And you make it yourself and can gussy it up as cute as you want. I wanted it to be for badminton, but also for everything I need in my daily life. One notebook I could carry around instead of relying on a few scattered everywhere. 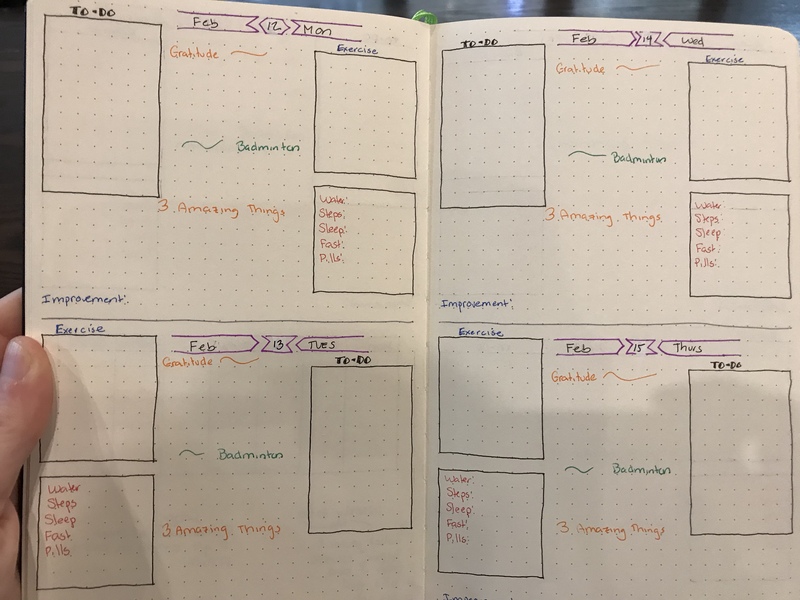 I wanted not only my tracking, but my to-do list, my schedule, my five-minute journal, my planner and a place to keep track of a few other things like my reading. You can see at the top I have written “Gratitude” which is where I write, in the morning, three things I’m grateful for. The second area is labeled badminton, where I can say where I played, for how long and how I felt. The third is three amazing things from the day that I write at night and one sentence at the bottom for how I could have improved my day. I also have three boxes on the side. One for my to-do list, one for listing my exercise outside of badminton, and one for tracking. With the help of apps, I keep track of my water intake, steps in a day, how much sleep I get, how long I fasted (I do intermittent fasting, more on that later) and what medicine or supplements I have taken. This is where I can write my weekly schedule and where I keep track of general “to-do” things that don’t have a specific day. Then at the end of the month I have a summary page. This was the month of January when I got sick and ended up in the hospital. I stopped tracking for more than a week, ’cause, well, I was in the hospital and couldn’t be bothered. Although aside from drinking water I certainly didn’t do anything else for almost two weeks. 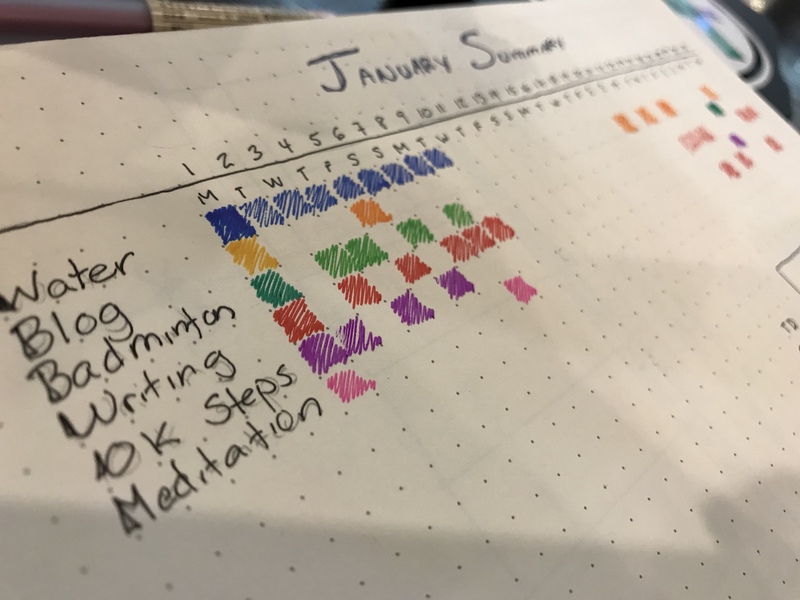 I keep track of everyday I reach my water goals (2.3 liters), everyday I publish a blog post (I have three blogs so I’m going to start differentiating by color), which days I play badminton, which days I do writing (any writing counts–blogs, diary, or my novel), the days I surpass 10,000 steps (I walked 10,000 steps everyday for more than a year but I have since stopped that), and the days I mediate–a habit I want to form, yet I’m not so good at. I am also a big reader. Before badminton I read 100 books a year, but last year I only managed to read 52. 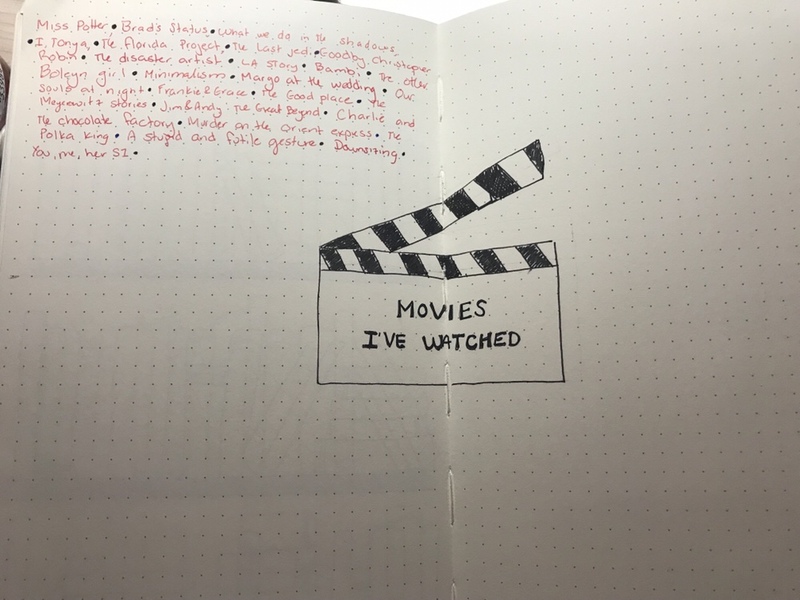 I’ve always kept a list in a notebook but now that I have a bullet journal I figured why not make it as cute as possible? After I finish a book I write the title on a spine. The actual movies (and compete seasons of TV shows) I’ve watched since Jan 1st. Go ahead, judge me. I’m going to change the color in the movie list and it will go from red to orange to yellow to blue and so on. By the time the pages are finished it should be as colorful as the rainbow. Right now I’m still in the red zone. 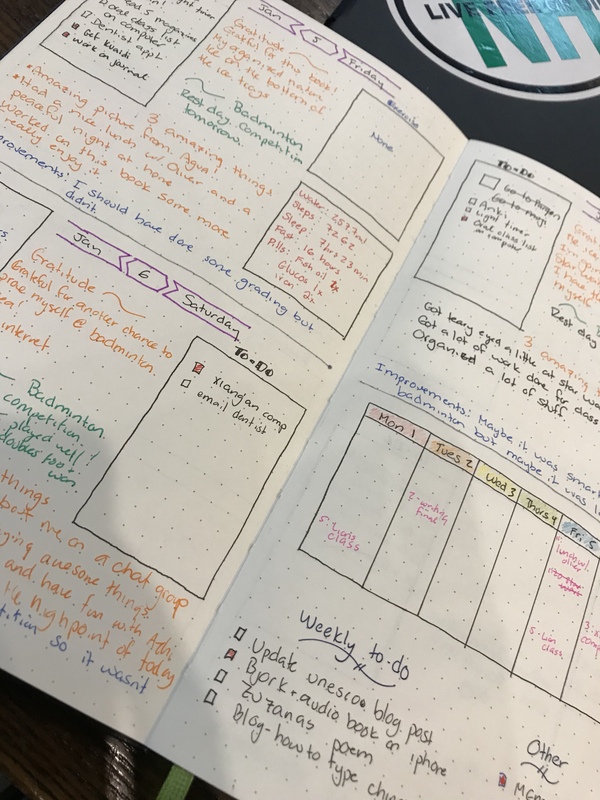 After all, a bullet journal and tracking diary is only good if you use it! So I always put it on my desk first thing in the morning so I have no excuse to forget it. I had trouble while I was in the hospital keeping up with it consistently. Like my friend who visited said,”must be hard to come up with three amazing things when your stuck in the hospital all day.” He was right, but isn’t that actually the time that it is most important to do it? I’m not a person with good handwriting or the patience to sit down and draw little things with precision. 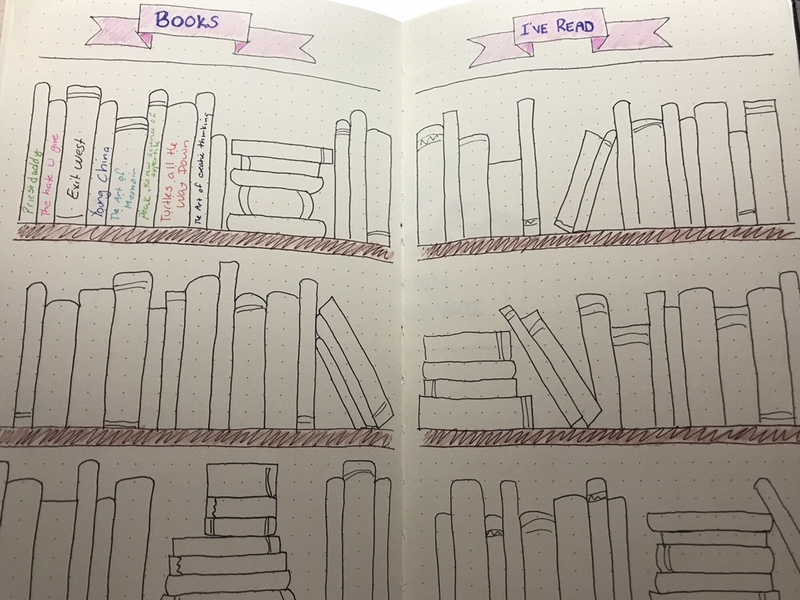 I’m a bit sloppy, my handwriting isn’t that great and I can’t draw a straight line to save my life, but I love my little bullet journal! I bring it with me everywhere and it is keeping me on track, keeping me positive and it’s a great brief record of what’s been happening in my life. 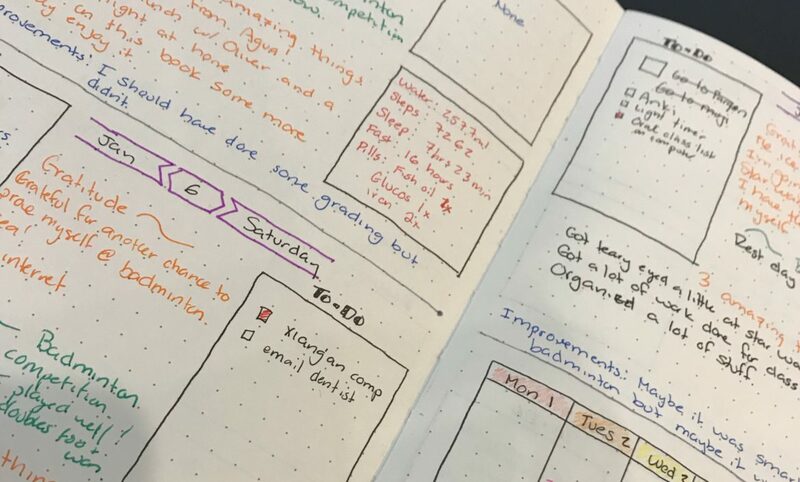 If you are interested in doing your own bullet journal, you can read this buzzfeed article for more information but of course Pinterest is the place to go for real inspiration. I think constant tracking and monitoring can only help improve your badminton and at the very least can show you how much you have accomplished. Recently found your page and i find it very interesting! If it’s possible, could you ask your coaches if during tournaments, they bring a notebook and jot things down? I have always wondered what badminton coaches write down when they watch their players games……. Such an awesome post, love it, love the idea, so organised. That’s what makes it unique, wouldn’t be the same if it was just photocopied. We should see done of these entries periodically.